Reclusive and sitting in a luxury home high above the San Pasqual Valley, the charismatic “Lord of All Indoors” Steve Zungul continues to mystify and impress, albeit out of the public eye. He hasn’t spoken to anybody in the media for over a decade. His legendary indoor soccer career continues to do all the talking. Fans of the Croatian indoor soccer scoring machine, perhaps the greatest player in professional indoor soccer history, continue to discuss and post testimonials to his football glory and magical reputation. Said goaltender, and former New York Arrows teammate, Shep Messing, “He was the greatest indoor player to ever play here. You talk about Tatu (Dallas Sidekicks Brazilian star) but nobody was as good as Steve. He partied, he played hard and he scored goals. Zungul, 63, born Slavisa Zungul, began as an outdoor star with Hajduk Split before controversy over his night life hijinks and possible compulsory Yugoslavian military service, spurred a move to the U.S. He started with the Arrows of the Major Indoor Soccer League and finished his career with the San Diego Sockers. Hence, his finding a home in retirement in the southeast Escondido hills. 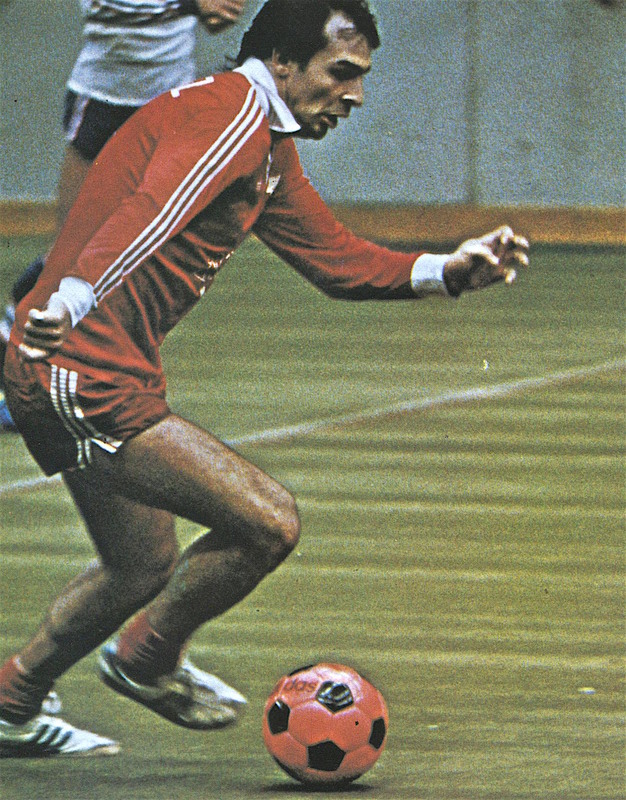 Steve Zungul busts a move with the MISL champion New York Arrows in 1979. 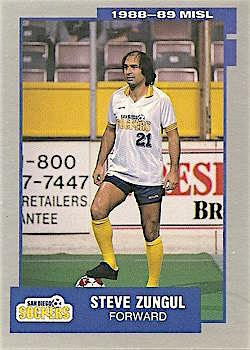 Zungul was kind of like the Babe Ruth of indoor soccer, rewriting MISL record books. Retiring at age 35, Zungul finished with 652 goals, over 200 more than second leading scorer Segota with 463. He led all players in assists with 1,123. Zungul was a champion many times over. He won eight of them with the Arrows. He moved to the Sockers and won four more championships. Legend mixed liberally with fact. Zungul slammed home seven goals in one game. He scored three goals in 37 seconds in another. He scored 108 goals in 40 games one year. During the 1981 championship sudden death overtime match against arch-rival St. Louis Steamers, on the road, he nailed the winning goal. His career was like a indoor soccer highlight reel. He was anointed “The Lord of All Indoors,” by JD Reed of Sports Illustrated and Americanized his name to Steve, finding glory in this new hybrid form of football played within a hockey rink’s dimensions with a fast-moving ball that ricocheted off boards, a kind of pinball and disco soccer perfect for the age. Lord of All Indoors” Sockers card. Zungul made is initial mark at Serbia, in the old Yugoslavia. He scored 177 goals in six seasons for Hajduk Split as the squad won three Yugoslavian First Division titles. He made 14 international appearances and was thought to be one of the top six forwards in all of Europe. Hajduk Split fell to British powerhouse Leeds United in the 1973 UEFA Cup semi-finals and lost to PSV Eindhoven, a tope Dutch team, in the 1976 European Cup quarter-finals. Leading European clubs like AC Milan reportedly wanted to spend a fortune to sign Zungul. Zungul, however, marched, or rather, partied to the beat of a different drummer. Kind of like Broadway Joe Namath of AFL fame, the good looking and highly personable Croatian legend partied all night long.and then some. Zungul’s Yugoslavian team management didn’t approve of his extra-curricular behavior. They suspended him without pay. Zungul also was subject to 18 months of compulsory military service through age 28. Dating Moni Kovacic, a Yugoslav model, who was about to visit New York, Zungul talked Split management into letting him play some indoor exhibition games accompanying her to the U.S. Popovic and Split let him go, figuring indoor soccer was considered a minor sport in America and nobody would care. Zungul played a few games with the Arrows. The MISL wasn’t regulated by FIFA, the international soccer governing body at the time that ruled the outdoor game. The Arrows offered Split $200,000 for his contract, but it was an offer Split apparently could refuse. That was a bad move. Zungul stayed with Arrows and Split never got a dime. Zungul quickly made his mark, scoring four goals in a December 1978 win over the Pete Rose-owned Cincinnati Kids. The Arrows with Zungul won its first title in March 1979. Zungul scored seven goals in a 14-7 win in the first game of the 3-game finals. He followed up with three gals in the clinching game. 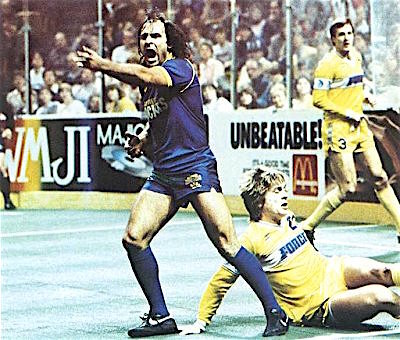 Steve Zungul in action with the San Diego Sockers. During the next three Arrows title runs, Zungul won playoff MVP honors. However, he constantly clashed with coach Popovic, who was known as a strict disciplinarian. Zungul’s continued parrying created rifts on the team. FIFA had banned indoor players from playing outdoors. The U.S. Supreme Court lifted that ban in 1983, allowing Zungul to re-join the international outdoor circuit. He signed with the Golden Bay Earthquakes of the NASL. Of course, he was fabulous. He scored 19 goals in 1983, then a league-leading 30 goals and MVP award in 1984. The NASL folded in 1984. Zungul went back to the arena, playing with the Sockers and the Tacoma Stars before retiring in 1990 due to hip injuries. But not before he blasted an overtime goal for the Sockers as they beat the Baltimore Blast in the 1990 championship series. According to Wikipedia, Zungul invested his earnings in various business ventures including real estate. He lives with his wife Lorenza and two children, Sashka and Marco. A brief investigation found him on Rancho Del Sol in Southeast Escondido. That’s where our story ends, abrupt as that ending may seem. Zungul seems content to let his legend, his former teammates and his fans do the talking for now. Be the first to comment on "‘Lord of All Indoors’ soccer legend Steve Zungul lives quietly in Escondido retirement"